onday, March 28, 2011 was a great day, a momentous day, a once-in-a-life time kind of day. It was the day I woke up to find my name in the Wall Street Journal. Yes, the actual Wall Street Journal. In mid-February I was contacted via e-mail by WSJ reporter Emily Glazer who had heard about Yoga In My School from Shari Vilchez-Blatt of Karma Kids Yoga in NYC (a million thanks to Shari). 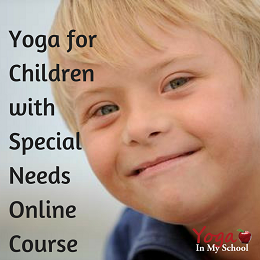 Emily was looking for information on yoga in schools, yoga for special needs, interesting/creative ways of teaching kids yoga. You’ve come to the right place! I remember calling my husband, as he was out of town on business, and saying I’d received an e-mail from the Wall Street Journal. He chuckled and said to make sure it wasn’t spam but was actually from wsj.com. It was. Emily & I e-mailed back and forth and set up an interview date & time. The interview lasted over an hour – a little longer than the 20 mins we’d planned on. Emily asked a lot of interesting, thought provoking questions and was intrigued by the interconnections between the brain’s function and movement. She was kind enough to ask about my personal story, how I came to be an expert in kids/teens yoga, and wanted as much information as possible about the kids yoga community and others involved in doing amazing things in bringing yoga to kids. For this we kept referring back to the Yoga In My School Interview series. 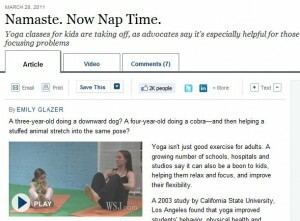 As well she wanted proof: studies showing the claims stating the benefits of yoga for kids were true. This is the Wall Street Journal after all, not a feel good article or a personal interest piece. Needless to say my follow up e-mail was lengthy with lots of links to substantiate the kids yoga and mindfulness movement and shine a light on the many amazing people with whom I have the privilege to work (check out our Yoga Links I Love list). Emily then pitched the story to her editors. She came back with further questions via e-mail and phone calls on various occasions wanting to know the number of schools in the US who use yoga, the costs of funding a yoga program, training expenses, locations where it is especially popular, and hurdles or obstacles which prevent yoga from being adopted into all schools. 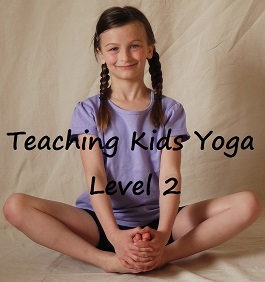 Some of these questions were challenging as I felt I was representing all kids yoga instructors with my answers and I wanted the information to be accurate, informative and authentic. Emily then let me know that the article would be published on March 28th. I waited. In the meantime I learned that WSJ was also filming a video regarding kids yoga and that elementary students in Encinitas, CA were involved in a photo shoot. By Sunday the 27th I was simply happy to have been part of the process, that getting the message out regarding kids yoga and the good it can do for children of all ages and abilities was what was most important. I hoped that the WSJ’s article was open and fair, and that thanks to its reach and credibility more schools would offer yoga to their students. It was with some trepidation that I googled the article Monday morning. First I found the video. How fun! Then I clicked on the article and found myself in tears as I read. Emily had done a fabulous job with the material … and I even got quoted. So yes, Monday, March 28th, 2011 was a great day! 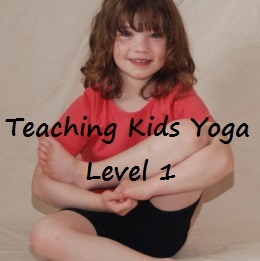 A great day for yoga for kids and teens. Please share the article with parents, teachers and school administrators in you know. Together we can make a positive impact on children’s lives, their mental, emotional and physical health. This is amazing and I’m so happy for you and all the work you’ve done to change the lives of children through yoga and your buoyant spirit! I’ll repost on Yogamint fb page! It was a great article with fabulous video as well – thanks for all of the input you provided to WSJ. Emily did a fabulous job summarizing it all. 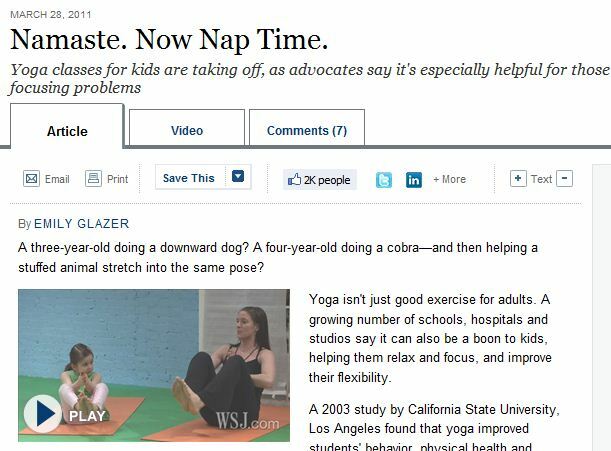 Exciting to have this type of coverage of kids’ yoga. Keep up the great work Donna and all the other amazing people out there sharing yoga and mindfulness education with children!